Chidinma Inspirations: LIFE IS BEAUTIFUL !!! There is a probability that as some people see/read the topic of this post, they might say ‘’what is so beautiful about life? When I have BILLS! BILLS!! and more BILLS!!! to pay’’. But to come to think of it, life indeed is beautiful. And when we understand how beautiful life is, we tend to see the beauty that comes with life or the beauty that life has to offer. Hence, we tend to magnify the Creator of our lives. Many a times we get so caught up with things/responsibilities/ goals/dreams/ambitions and to sum it all up… our destination that we fail to pause and see the beauty of life. We get so caught up in trying to get to our various destinations (no matter what it may be) that we fail to appreciate the beauty in our life’s journey. There are many beautiful things in life that makes life so beautiful. I am very sure, some might say ‘’Are you trying to tell me to ignore my responsibilities/my dreams in the name of life is beautiful?’’. Of course not, all I am saying is, once in a while, take a step back and perceive the beauty that comes with life. Appreciate life. When we get all caught up with our ambitions etc we fail to appreciate the beauty that comes with life like, the sunny weather, the cool and breezy weather, the oceans, the trees, the gardens, the air we breathe, our eyes that we use to see, our ability taste, our ability to forgive, our ability to feel, our ability to love, the food we eat, our friends, our families, our loved ones, our culture and so much more. You can search this blog with the hashtag #Discoveries to see, love and appreciate the beauty in some of God’s creations. So beautiful people, while in your pursuit for happiness, while in your pursuit for a better life, once in a while pause and live! Pause and appreciate your life’s journey. Pause and be thankful. Cos in the end, your priceless memories or your stories will come from your life’s journey and not your destination. Don’t look back and be filled with regrets. Don’t let your life be filled with ‘’Had I known, I would have appreciated life more’’. ‘’Had I known I would have not allowed myself get so caught up with trying to get there (whatever your destination is) that I failed to live in the moment’’. Pause And Perceive The Beauty That Comes With Life. Pause And Appreciate The Beauty In Your Life’s Journey. 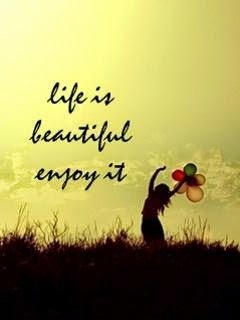 Pause And Live In The Present, Cos Life Is Beautiful! ‘’Make sure you live each day well so that when you look back, there won’t be any regrets’’ (Chidinma Inspirations, 2014). I hope this post inspired you. If it did, please be kind enough to share with others to inspire them as well.